OLS is a part-time, 90 credit associate degree program. It takes four years to complete, and includes a six-month internship. There are no classes during summer quarter. How many students do you accept each fall? 2 cohorts of 15 students are admitted for each fall quarter. Because space is limited, we recommend applying early. However, we will consider admitting a 3rd cohort of 15 students if the waitlist accommodates it. Please contact Bellevue College Student Housing for information on living on campus. You can also visit our Community Resources page to find groups that may be able to assist in finding housing options in the area. How much does the OLS program cost? Current tuition for the 2018-19 academic year is $455.00/credit. Our program strives to keep fees and textbook costs to a minimum, with the majority of each course’s textbooks ranging from $25-50. Please visit our Financial Aid page for information on applying for financial aid. Additional assistance is available at the BC Financial Aid office on Main Campus or at 425-564-2227. We recommend starting the financial aid process as soon as you make the decision to attend college. Although financial aid may be available, the amount received from financial aid generally does not cover the entire cost of each quarter’s tuition. Are scholarships available for those with learning disabilities? 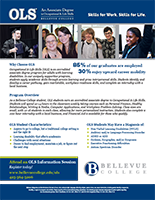 For Bellevue College scholarship information, please visit the Bellevue College Foundation page. Other scholarships may be available through other resources. Visit our Resources page for more information. Is there a benefit to applying for the Priority Admissions Deadline? Absolutely! Because only a limited number of students are admitted each year, the chances of being put on a waiting list are less likely if you apply by the Priority Admissions Deadline. Students who take advantage of the Priority Admissions Deadline and meet the requirements will be assessed and admitted into the program by early May. This gives students and families time to figure out details regarding tuition, transportation, and housing, if applicable. What educational documentation will I need to provide when I apply? Educational documentation and/or an IEP documenting IQ scores of 70 and above and academic levels in reading, writing and math at a fourth-grade level or higher are required. For more information, visit our Admissions Process page. For homeschool students, what document would show completion of high school? A certificate of high school completion will do. Can I take classes on the Bellevue College Main Campus while attending OLS? As a Bellevue College student, you are able to take classes outside of OLS. However, due to the course workload, it is not recommended. I already have credits from a college outside of OLS. Are they transferable? While college credits are good to have, our courses are specific to the OLS associate degree. Therefore, courses taken outside of OLS will not meet the requirements of this degree. Will my associate degree at OLS be transferable to a four-year college? The associate degree in Occupational & Life Skills is a non-transferable, terminal degree. It will not meet the requirements for any other associate or bachelor degree programs. Session for prospective students, families and special educators. Hear what our students have to say about OLS.